The Royal Naval Museum traveled on board the submarine NORDKAPEREN during its last expedition and here attempted to document the conditions on board this class of submarines. Four days sail is portrayed through this article which gives a fair picture of the life on board. At the end of May 2001 two staff members of the Royal Naval Museum participated in an expedition with 5th Squadron as part of the museum’s continuous efforts of documenting daily life in the Navy. The submarine NORDKAPEREN was participating in the annual BALTOPS exercise in The Baltic Sea and since it was going to be the last expedition of NORDKAPEREN before being decommissioned the museum thought it obvious to arrange a documentation of this particular expedition. NORDKAPEREN, still on active duty in 2001, was build at the Royal Naval Shipyard in 1968 and was the last unit built at the now closed shipyard. Like its sister ship NARHVALEN, NORDKAPEREN had a displacement of about 500 tons, length 44 meters, 4.5 meters wide and a draught of 3.8 meters. It was commissioned in 1970 and in 1974 it was the first Danish submarine to cross the polar circle submerged. Line drawing of the submarines of the NARHVALEN Class. In this article I would like to make a recount of the observations that I and museum keeper Jacob Seerup made during the expedition. We participated in the first four days of the exercise which was a surface sail from Frederikshavn to Gdynia in Poland. From Gdynia NORDKAPEREN was scheduled to participate in 14 days of exercise in the eastern parts of The Baltic Sea but for practical reasons it was not possible for us to participate in this part of the exercise. Our aim was to document partly the day to day life on board and partly what the vessel was like as a place of work using both interviews and simple observations. The boat and its crew were photographed in action and we made audio tapes to get a feel of the atmosphere on board. And finally we were keeping our eyes open for artifacts for the museum’s new exhibition concerning the period after 1945. 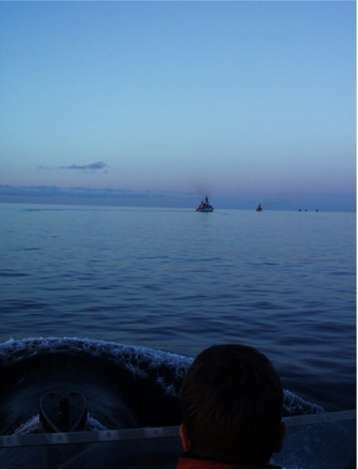 41 vessels participated in BALTOPS 2001 of those 7 vessels from the Danish Navy. The Danish Task Group, which was formed at the turn of the year 2000/2001, was in action for the first time during BALTOPS 2001. The Task Group was physically on board the offshore patrol frigate HVIDBJØRNEN from where it was in command of the Danish ships participating in the exercise. Exercise BALTOPS is a direct continuation of the exercises which the NATO Alliance conducted in The Baltic Sea during The Cold War. At the time it was a demonstration from NATO’s side showing that The Baltic Sea was not a closed Warsaw Pact area. Today the message is practical cooperation with our new allies. The crew of NORDKAPEREN were very much looking forward to going to Poland and see Gdynia and meet the crews of the other participating units from other navies. Before even boarding NORDKAPEREN we had an extensive safety course by NORDKAPEREN's Marine Engineering Officer (MEO). He went through the different types of wrecks the submarine could sustain and how we were supposed to react should an accident happen. On board the submarine there were both life vests, respiratory aid and masks and in the "winter garden" (forward deck) was placed a life raft, which could hold the entire crew. It was somewhat an experience to have all these accidents depicted just before boarding but it was nice however to know that everything had been thought of. After covering the ground in theory it was followed up by a damage control exercise shortly before leaving Frederikshavn. Everybody had to go to their damage control stations and test the so called "BIBS" (Build-in-breathing system), breathing apparatus and masks protecting against gasses, carbon monoxide, water, etc. Loading of the NORDKAPEREN was done through the forward hatch. When we arrived in Frederikshavn they were still loading the submarine for the long cruise. A lot was taken on board and every spot available was used. Despite its 33 years of age NORDKAPEREN was in good shape but was decommissioned as a result of the 1999 Defense Agreements. The submarine was fully operational and its crew claimed that it was both the fastest (20-22 knots submerged) and the most silent of the 4 Danish submarines in service. NORDKAPEREN was picked for "moth-balling" because the crew conditions on the other submarines were better than on NORDKAPEREN. Despite the submarine's high age no one on board had reservations about diving with it. In peacetime you were not allowed to dive deeper than 100 meters; in wartime the limit was 250 meters. However several of the crewmembers of NORDKAPEREN thought that it could dive considerably deeper. 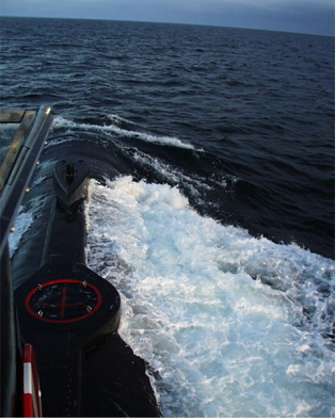 After the decommissioning the crew would be transferred to other submarines – the majority would go to the newly bought Swedish submarine NÄCKEN. Rumors were circulating on board about the coming change and some guesses as to what the new name would be once NÄCKEN was transferred to Danish service. Rumors were all pointing at the name KRONBORG which was not with qualified enthusiasm; among other things since no Danish submarine had ever been named that. There was a crew muster on the quay before departure. The Executive Officer (XO) made a short speech where he enjoined how the crew should conduct themselves during the visit in Poland among other things. He particularly made a point of the crew being careful not to get mugged both in the city and the darker spots on the base itself. The first part of the cruise went on battery propulsion. It was a very pleasant and quiet sail – almost like on a sailing ship. Battery propulsion was used until the batteries were down to a 40% performance. Then they switched over to diesels until the batteries were recharged and they switched to batteries again. This was done in order to maintain the boats' 90 tons of batteries. The crew were generally happy that so much of the cruise was done on batteries since the diesel engines were both noisy, stank and created a draught on board. It was our impression that the work climate on board NORDKAPEREN was not characterized by a heavy discipline. Everybody acted fairly relaxed and yet very professional. Everything gave one the impression that people knew their stations and work routines inside out and only in very few cases did the Captain need to specify an order. However this in the light of a surface sail being much less demanding than a submerged sail, and we were subsequently told that during submersion conditions were somewhat more disciplined. They were used to visitors on board NORDKAPEREN. Ever since the talk about relinquishing the submarine weapon started the Submarine Squadron had had on almost every cruise reporters, politicians, people employed in the forces and even Her Majesty The Queen on board. The boat crew were also very friendly and accommodating towards us. NORDKAPEREN sailed without torpedoes on this cruise. 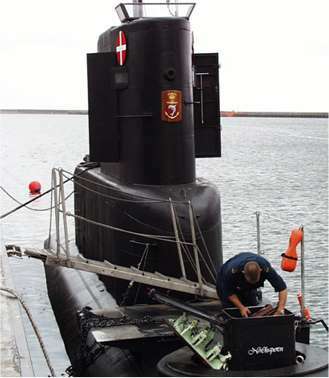 In December 2000 NORDKAPEREN had had a test firing where the exercise torpedo exploded 40-60 meters after launch because of an engine failure and at the time of this cruise they were still working to prevent a repetition and in the meantime no Danish submarine sailed with torpedoes. Instead the torpedo tubes were filled up with various food and drinks provisions. Had the tubes been filled with “fish” they would have had big problems storing all the provisions. NORDKAPEREN's two torpedo men checked the tubes for leaks, etc. every day but other than that they did not have a lot to do. They were however part of the watch roster like the rest of the crew. NORDKAPEREN only had torpedo tubes in the bow. An interesting detail was that the loading of the torpedo tubes was done by taking the torpedoes on board through the two upper torpedo tubes. Then they were manipulated around in the boat to be able to fit them into their respective tubes. It was said to be very hard work. As one of the last navies in the world, a no smoking rule on board all the submarines was made effective around the turn of the year 2000/2001. This meant that smokers had to go up on the open bridge, when they wanted to smoke. As a result there were almost constantly two to three smokers besides the lookout watch on the bridge on surface sails. During messing we ate in relays of two because of people constantly needed on watch but also due to the lack of space, it simply wasn’t possible for everybody to eat at the same time. NORDKAPEREN was only equipped with 18 bunks for the 25 man big crew which meant that the crew had to share the bunks. The only ones who had a bunk of their own was the Captain, the cook and the MEO. Generally there was very little space on board and one had to be careful not to stand in the way of people who wanted to pass. When the crew wasn’t on watch they were either in their bunks or on the bridge. It would be unbearable on board if everybody just walked around in the narrow passages all the time. The lack of bunks meant that the ships company would have to be booked into a hotel in Gdynia. Only the watch crew slept on board. This is a usual thing for the submarines but somewhat different than with the rest of the Navy's ships. However this would change with the new submarine KRONBORG where there are bunks for the whole crew. There was only one heads on board and you washed hands and rinsed in salt water. The fresh water was mainly used for cooking. In the heads there was a bag of wet naps to enable you to clean your hands. The "potty", as the heads was called, was ejected when the tank was full. Normally the potty was ejected on the graveyard watch but if the tank was full the "ejection" could be expedited. All garbage on board was sorted and the organic was ejected together with the "potty" while the non organic was collected to be thrown out in Gdynia. The organic garbage are placed in the "potty" before "ejection". After the first evening mess of the cruise there was a rather hectic atmosphere on board while everybody helped stow the food provisions away. This took a couple of hours and especially the empty torpedo tubes were filled to burst. Everywhere there were provisions and other things used on the cruise stowed away. Food provisions for the 18 days of the cruise had been brought along. HVIDBJØRNEN, which we were to rendezvous with in Gdynia, carried some frozen goods but other than that the submarine was packed with 18 days of provisions for 25 men. This also meant that the space conditions would improve little by little as the crew ate their way through the provisions. After unpacking the crew went about with their normal work tasks and watch rotation. The crew was in charge of sharing out the work of helms watch, etc. on board. The oldest able rating on board handled the actual duty roster which however had to be approved by the XO. The tone the crew used amongst themselves was a little harsh. Especially the cook was a whipping-boy and the tone was not always courteous. As the darkness descended the ships’ lights and the flashing blue light, which is the characteristic submarine signal, was lit. At 2200 hours the television was ordered turned off and the crew not on duty turned in. The ship quieted down. The stillness was only disturbed by sounds of snoring from the different bunks. Shortly after the lights went on a vessel was observed on near collision course. NORDKAPEREN therefore had to alter course. In many instances the submarines had to alter their courses even if they had right of way according to the maritime rules. The submarines are often overlooked not only because they are painted black and show small in the field of vision, but also because they are the size of a large speedboat on the ships’ radar screens. At 2400 hours the graveyard watch was roused from their berths. The duty part of the watch went quietly. Sleep was rubbed out of the eyes and the personnel quietly packed their bunks before they went to their stations. During the night we left the coast of Jutland and the wind blew a strong breeze. It was felt in the rolling of the ship but since the bow of the submarine was under water the ship didn’t pitch. It only rolled which was like lying in a giant cradle. The cook on board had a difficult job with 14 hours of duty every day. He was a conscript and a trained cook. However we were under the impression that he did not mind all that much being drafted. He had trained at a 5-star French restaurant and confessed that he wasn't used to cook "ordinary" meals. He therefore saw his time in the Navy as a bit of a challenge – even if it meant a salary cut from Dkr. 14,000 to a mere Dkr. 4,000 a month. 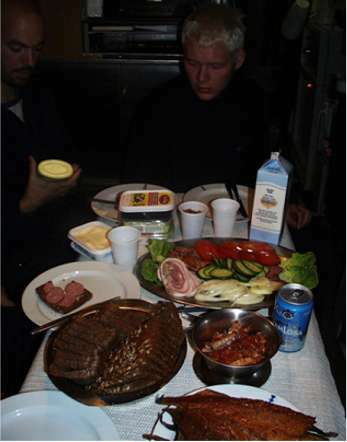 Food was very important for the morale on board and we have to say there was plenty of it. Food was very important for the morale on board. Several of the crew members expressed that they often restricted themselves to 2 meals a day since there wasn’t much space for exercising on board and it was therefore easy to gain weight during long cruises like this. One thing they didn’t ration was the coffee which everybody enjoyed immensely and in large quantities. On the second day of the cruise the officers and crew both started to plan what was going to happen after the arrival to Gdynia. An "Open Ship" had been planned and the officers were preparing for it. Several of the crew had been to the library before sailing to borrow "The trip goes to Poland" and "Lonely Planet" and there was an ongoing discussion of when they were going sightseeing in Gdansk and what to see. It was difficult to find a time where everyone interested could come along since many were on duty while the submarine was in Gdynia. At the same time the XO requested 2 volunteers for a sightseeing trip to a local castle from the middle-ages and 2 to a reception on board HVIDBJØRNEN. XO pointed out that if nobody volunteered they would pick someone to fill the spaces. As it turned out this was not necessary. After the noon messing it was time for a clean-up. This was a team-work where everybody not on duty or asleep helped. Two were quietly picked out to help the cook do the dishes. After cleaning 3 petty officers met in the Petty Officers' Mess for a little PET – Physical Education and Training. To make room for this the table in the Petty Officer's Mess was removed which allowed one man at a time lie on the deck at full length. While the petty officers did their PET, "turnips" (potatoes) were peeled on the mess deck. We were somewhat surprised to learn that it was tradition to show a so called "Star movie" (adult movie) on the TV in the mess during this activity. Precisely how and why this tradition had started no one really knew. All the messes were equipped with TV and VCR but we didn’t see them used very much; partly because the TV disturbed the people asleep and partly because the signal could be difficult to receive at sea. There was a large collection of video films on board and quite a few films were seen on the cruise. The ships’ welfare officer had received a small amount to purchase new videos for the mess before the cruise. Just time for a card game. 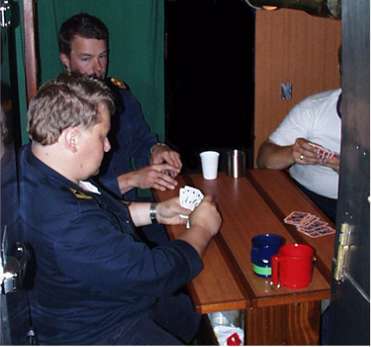 Several of the older crew members of NORDKAPEREN said that the social time together had been better before the installation of VCR and TV in every mess. People were talking and playing cards more before than they did today. There were still card games going on though and even the Captain didn't refuse a game of cards. 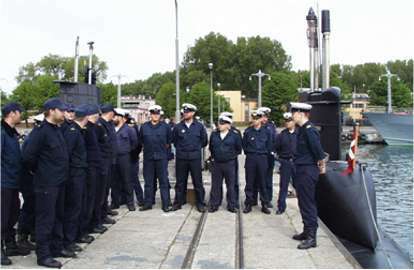 An ongoing training of the ships' crew took place under way to Gdynia. On the eve of the second day a new helmsman was "broken-in". As part of his training the hydraulics to the helm was disconnected without his knowledge. This meant that NORDKAPEREN lost control of the steering. As soon as the helmsman discovered this he was to report it and subsequently NORDKAPEREN was stopped while an emergency helm was rigged. 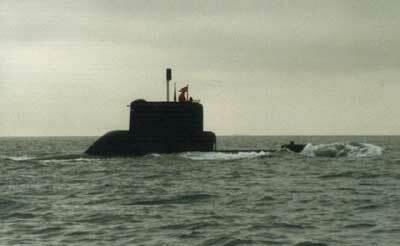 It was voiced that the Submarine Squadron was affected by a continuous lack of personnel. This due to the fact that people were off on further training in Norway, Sweden and England and that many of the squadron's employees with the high education, which many of the positions demands, could get a job both with better salary and a 9-4 work-hour in private businesses. This is why the Captain put so much energy into explaining what and why he gave the different orders, so as to teach at the same time. It was necessary because of the many new people on board. During our documentation of the Operations Room we discovered to our big surprise and the crews’ great amusement; that NORDKAPEREN was from the Danish Naval Material Command equipped with pocket calculators driven by solar energy. Maybe not the best investment in a submarine. NORDKAPEREN's bow seen in the steady sea. On the third day of the cruise a striking smell of man began to spread in the ship. Duty commander in the engine control room was the ships' bath attendant. Warm water for bathing was only a possibility after the ship had sailed on its diesel engines. If one wanted a shower at any other time it would have to be in cold salt water. It varied with each individual how much the crew showered. The engine crew who worked in the heat from the engines tried to keep a standard of a shower every third day while others on board admitted that 10 days could easily pass without a shower. However a shower was often the most important task to undertake after entering a port of call. Since the commissioning the total amount of snorkeling done by NORDKAPEREN was recorded in the engine room. In May 2001 the number was 1284 and each time another 100 was reached they celebrated the anniversary. Earlier they would celebrate with a cigar but because of the no smoking rule they now had to make do with chewing tobacco. On the morning of the third day a simulated dive was done in honor of the two special correspondents from the Royal Naval Museum. The simulation includes among other things a simulated attack on a Polish fishing vessel which however continues to sail on without detecting what kind of danger it had been in. During times of war a torpedo would hardly have been wasted on such a small target but as an exercise target it was useful and we got both good photos and sound from a well accomplished attack. After lunch "Sparks" was in charge of handing out money to spend in Gdynia. No one really knew why it was the radio officers job – "that's the way it's always been". Rendezvous with the rest of the Danish Squadron. We rendezvoused with the rest of the Danish squadron participating in BALTOPS Friday morning at 03:30. They had departed a day later but because they sailed at greater speed they had as planned caught up with us outside Gdynia. NORDKAPEREN was last in the line of ships and together we sailed into Gdynia. Entering the harbor NORDKAPEREN had trouble keeping the line and several times the command "full speed ahead" sounded. The Captain thought it no surprise if the other ships started to name NORDKAPEREN "the yo-yo"! During full speed the hatch to the bridge was closed to avoid any risk of taking in water through the hatch if the submarine suddenly started to dive due to the high speed. Near the entrance to the naval base a Polish officer who knew the locality came on board to guide us into harbor. NORDKAPEREN berthed as the last of the Danish vessels. A sentry at the gangway, dressed appropriately in a handsome uniform, was quickly arranged, then a general clean-up of the ship commenced. As mentioned an "open ship" was arranged for Saturday and Sunday which called for an all area scrubbing. Not everybody participated in the cleaning. If 25 men were to run around below deck at the same time they would only be in each others way as previously explained, thus a large group of the crew passed the time on the quay talking and observing the naval units of other countries in port. After the cleaning there was a muster on the quay where XO welcomed everybody to Gdynia and explained what was planned for the rest of the day. He repeated his warnings from Frederikshavn concerning the temptations of nightlife in Gdynia. After a welcome beer the crew who was not on duty left the submarine to check in at the hotel and get the sought after shower. After the cleaning there was a muster on the quay. Two tired and slightly evil-smelling correspondents from the Royal Naval Museum said goodbye to NORDKAPEREN on the quay in Gdynia. NORDKAPEREN was planned to go to the naval shipyard and make ready for decommissioning after participating in BALTOPS. The decommissioning involved stripping the ship of its equipment and emptying the engines of all fluids to avoid rusting. Subsequently, NORDKAPEREN can be laid-up for several years before the submarine probably will be scrapped as part of the 2004 Agreement on Defense. Finally Jacob Seerup and the writer of this article wishes to thank 5th Squadron and in particular the then crew on board S321 NORDKAPEREN for excellent care and for the great experience it was to be part of NORDKAPEREN's last expedition so far. Jacob Seerup and I collected a number of artifacts which together with a couple of key photographs forms part of the Royal Naval Museum’s exhibition about the submarine weapon.